Heidi Klum strolls into the hotel at the ungodly hour of 5:30 a.m. to wake the designers up and send them on a road trip to Coney Island. There Tim Gunn introduces them to Dave Smetter - VP of Marketing Communications at Yoplait Frozen Yogurt. On the boardwalk behind him are 7 frozen yogurt carts. This week is another unconventional challenge as well as their first team challenge. They will work in pairs drawn from the dreaded button bag. A loud sigh of disappointment all around. The duos have 15 minutes to hand out samples to people on the boardwalk and ask them for descriptive. sensory words. 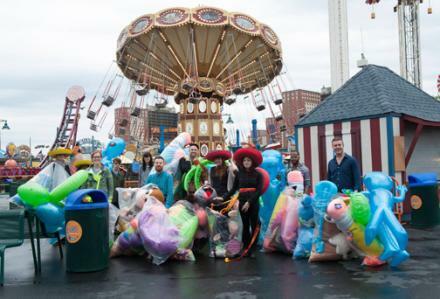 They are then given 30 minutes in Luna Park amusement park to play games. Each GoBank card is charged $100, giving them unlimited access. The prizes won are to be the materials used to create one look per team inspired by just 3 words from those offered by tasters. They only had until 11 p.m. that night to finish their look and Kelly Osbourne of Fashion Police would be the guest judge. The work room quickly became absolutely filled with dusty bits of stuffing that clung to hair, pant legs and every surface! There are 2 teams that just do not work. One is a surprise - Sandros and Sue. She really likes his sense of humor so thought it would be a great experience. WRONG! Sandros becomes very controlling and actually offensive. Sue would try to input ideas and he would just tell her no, wrong, takes too long, not going to do it. There was no attempt to include a single idea of hers and many comments were downright degrading. During Tim's critique, she drew something on a sketch pad while talking and Sandros reached across, X'ed it out and said NO! In the end she just said she would intern and do whatever he said to get it done. He thanked her and then when they were told they were safe remarked, "When a woman listens to a man it's so cool!" Gross!! He's on my list of hope they go home soon now. The other team that had issues - no surprise - was Miranda and Timothy. They are from the same area and there is bad blood between them. How does that supposedly random button bag know to put them together to create drama? Timothy is actually a nice person, but so out there that he is hard to work with. Miranda did her best to be positive, even winning him a unicorn to keep that was not used in the challenge, but it all quickly went sour. Timothy spent a lot of time weaving strips of yellow vinyl ball together to create a jacket and accents. When Miranda left the workroom for a few minutes, Timothy tried to redesigned everything. He also didn't accept Tim's comments saying, "Just because he gave us a negative critique doesn't mean our project is bad." Miranda unfortunately loses it and turns into the ugly, mean girl in the sewing room - something she ends up deeply regretting. Kate and Helen's were top 2 and surprised each other by really enjoying working together. Kate dealt with construction and time management while Helen pushed the look outside of the box. Kate generously stated Helen should win for the uniqueness she brought to the design and the judges agreed. It was made out of sombreros and lined with fabric from a stuffed monkey. Comments included - I am very impressed, it is like a beautiful art piece, head to toe the look is really awesome, I think this was a real high fashion moment without losing any whimsey or fun, sculptured, tailored, refined, the dramatic red was perfect, I think it's absolutely incredible that it's made out of sombreros, hugs the body in all the right places, a lot of girls would fight to wear this on the red carpet, sombrero saturn chic (from Zac), such a smart material choice, love how you used the brim, polished, well-made, it's like a sculpture and well done. Dom and Alexandria chose to work with stuffed frogs, monsters and ice cream cones to create this sweater dress and mini skirt inspired by japanese street culture, the stuffed characters they were working with and the words playful, energetic and texture. I was surprised to learn that Alexandria had a greater hand in this direction as I thought Dom was more outside the box. Because this was so outside the norm from what has been seen previously on the show I was curious how the judges would receive it. As it ended up in the top 2, obviously they were fans. Comments include - I think it's so fun, love the way you've styled it, very now and of the moment, I want it too, it came out and it just made me smile, great look from head to toe, I think you did a fantastic job, well done ladies, very inventive and very fun, I think it's adorable, it makes me happy, what I love the most is the styling, it feels like an instagram moment, I love the humour in this and really well thought out. Justin and Alexander decided to work with blue vinyl aliens, a vinyl whale and the words summertime, smooth and playful. The original concept was a colour blocked bra top and skirt. During a critique, Tim mentioned he felt it needed something more to keep it from being too young and costumy, but the designers went too far in response. In the end, I think Justin has a better critical eye. As it went down the runway Alexander talked about how wonderful it was, but Justin noted that is was probably too much and he was right. Comments include - way too much going on, it looks like a hot mess, a lot of work in it and techniques and I do appreciate this but..., when you're working with colours this bright sometimes it's better to let them do the talking, over bedazzled, you have to edit, this is the unconventional challenge so the 2 choices are to go fun or chic but you 2 couldn't make up your mind, it's over worked, better without the jacket and looks like a kid did it. Timothy and Miranda went with yellow vinyl balls and a vinyl whale to create their blue dress with a textured yellow jacket. Their lack of connection came to a head as the judges talked to them. Miranda confessed her unkindness and expressed remorse, then clearly took responsibility for what part she was to blame for. Timothy commented if he was working with a better designer it would have turned out fine. So yesterday she looked awful, but on the runway Timothy became the mean kid. He has been in the bottom 3 weeks in a row and it really was his time to go. Comments include - it is so boring and you worked so hard on this, it looks like you sat on a pool toy and it deflated, I see all the intensive work but it's not effective, it looks like a life vest, this colour combination reminds me of some toxic hazard, if this was in black/white it might be really cool, I think you both had really good ideas but together they created a bad one, I've seen a how-to video on how to make a vest like that and neither are good but the dress is better. Sue and Sandros - I mentioned this team above, but wanted to add their look was created from blue vinyl dolphins and a sombrero (the belt). While the look was good enough to get them through, it probably could have been exceptional if Sandros has just let Sue have some input into the design. She offered some really unique ideas that he just rudely panned. I wouldn't want to work with him. I thought Ken and Jeremy's really stood out. They were the only ones to create pants and the look reminded me of the top 2 looks in that it was very wearable. They worked with a blue vinyl alien (pants), stuffed ice cream cone (fake fur jacket) and I think the bustier is created from a sombrero. Last but not least are Brandon and Karen who decided to go very avant garde with their green vinyl aliens and stuffed animals - something organic that swirled and grew as you turned it around. Tim was a fan during the critique commenting, "No one else in the room is doing anything even remotely like this.You're leading me and my imagination and I find that very exciting." 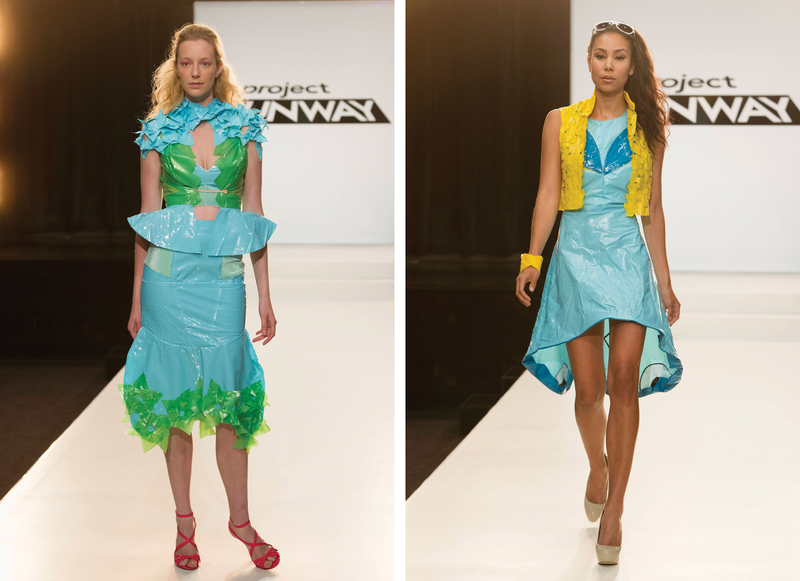 To view more images or to look at these in a larger format, go to RATE THE RUNWAY.